If all of the million records are sold at full price with no discounts or record clubs, the band earns $2 million in royalties, since their 20 percent royalty works out to $2 a record. Two million dollars in royalties minus $2 million in recoupable expenses equals … zero! How much does the record company make? It costs $500,000 to manufacture the CDs and they advanced the band $1 million. Plus there were $1 million in video costs, $300,000 in radio promotion and $200,000 in tour support. The company also paid $750,000 in music publishing royalties. They spent $2.2 million on marketing. That’s mostly retail advertising, but marketing also pays for those huge posters of Marilyn Manson in Times Square and the street scouts who drive around in vans handing out black Korn T-shirts and backwards baseball caps. Not to mention trips to Scores and cash for tips for all and sundry. Add it up and the record company has spent about $4.4 million. So their profit is $6.6 million; the band may as well be working at a 7-Eleven. And that explains why huge megastars like Lyle Lovett have pointed out that he sold 4.6 million records and never made a dime from album sales. It’s why the band 30 Seconds to Mars went platinum and sold 2 million records and never made a dime from album sales. You hear these stories quite often. A word here about that unrecouped balance, for those uninitiated in the complex mechanics of major label accounting. While our royalty statement shows Too Much Joy in the red with Warner Bros. (now by only $395,214.71 after that $62.47 digital windfall), this doesn’t mean Warner “lost” nearly $400,000 on the band. That’s how much they spent on us, and we don’t see any royalty checks until it’s paid back, but it doesn’t get paid back out of the full price of every album sold. It gets paid back out of the band’s share of every album sold, which is roughly 10% of the retail price. So, using round numbers to make the math as easy as possible to understand, let’s say Warner Bros. spent something like $450,000 total on TMJ. If Warner sold 15,000 copies of each of the three TMJ records they released at a wholesale price of $10 each, they would have earned back the $450,000. But if those records were retailing for $15, TMJ would have only paid back $67,500, and our statement would show an unrecouped balance of $382,500. 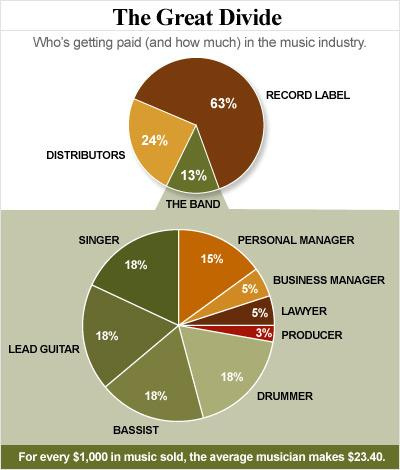 So, back to our original example of the average musician only earning $23.40 for every $1,000 sold. That money has to go back towards “recouping” the advance, even though the label is still straight up cashing 63% of every sale, which does not go towards making up the advance. The math here gets ridiculous pretty quickly when you start to think about it. These record label deals are basically out and out scams. In a traditional loan, you invest the money and pay back out of your proceeds. But a record label deal is nothing like that at all. They make you a “loan” and then take the first 63% of any dollar you make, get to automatically increase the size of the “loan” by simply adding in all sorts of crazy expenses (did the exec bring in pizza at the recording session? that gets added on), and then tries to get the loan repaid out of what meager pittance they’ve left for you. Oh, and after all of that, the record label still owns the copyrights. That’s one of the most lopsided business deals ever. So think of that the next time the RIAA or some major record label exec (or politician) suggests that protecting the record labels is somehow in the musicians’ best interests. And then, take a look at the models that some musicians have adopted by going around the major label system. They may not gross as much without the major record label marketing push behind them, but they’re netting a whole lot more, and as any business person will tell you (except if that business person is a major label A&R guy trying to sign you to a deal), the net amount is all that matters.